It’s always fun to experiment with different techniques underwater. 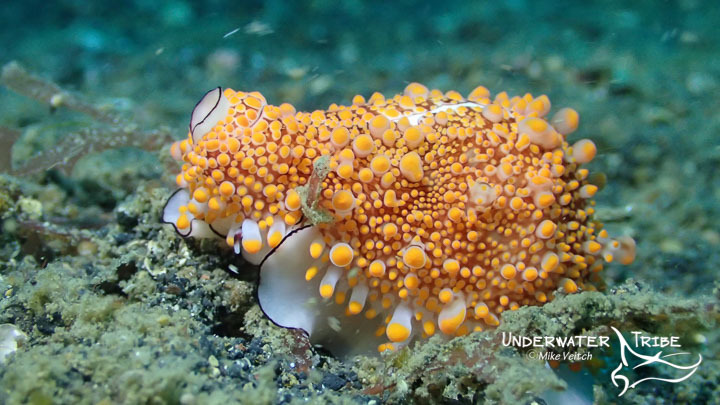 As I am in Lembeh with the Underwater Tribe and no particular deadline or assignment in mind I have been using the time to try out a few different cameras and shooting styles. One of the styles I have been playing around with is the use of “constant light” from a powerful underwater light, my Fisheye FIX 7000 in this case. The results have been fairly encouraging, even though I have only tried it a few times with no real scientific basis behind it. The photo above is from the Panasonic GH-4 in a Nauticam housing with 12-50 lens with the settings of 320 ISO, f8, and 1/100 and the Fisheye FIX set to 50% power. I am sure that if I spent a bit more time on lighting I could have achieved better colour but it was a quick and easy snapshot in shallow water (about 5 metres) just to see what I would get. 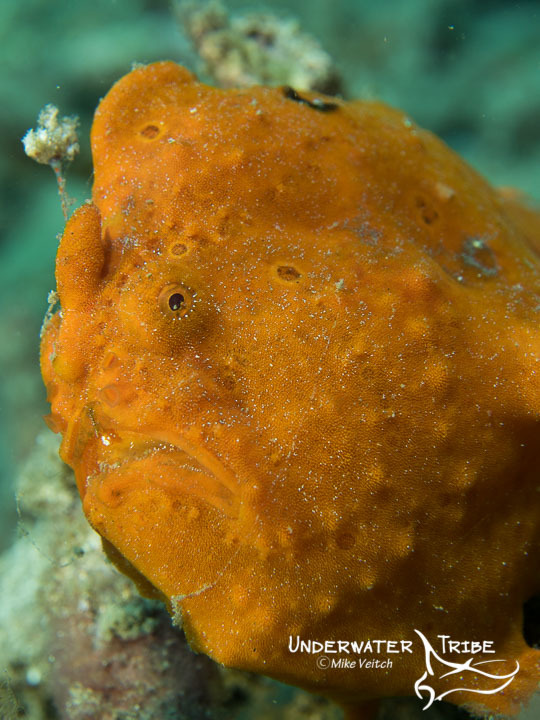 On the other hand, here is the same frogfish shot with a single Sea and Sea YS 110 alpha strobe with the same camera set to: ISO 320, f22, 1/200. The colour saturation is obviously better on this shot and if would certainly work better as a print or published photo, however, there is nothing wrong with the constant light image and it looks fine on social media and the web. For folks not interested in the finer points of having to deal with fstops and strobes then this is a nice combination that gets good results. These shots are straight from the camera, I am sure with a little TLC in Photoshop or similar then the constant light photo could pop the colours as well. 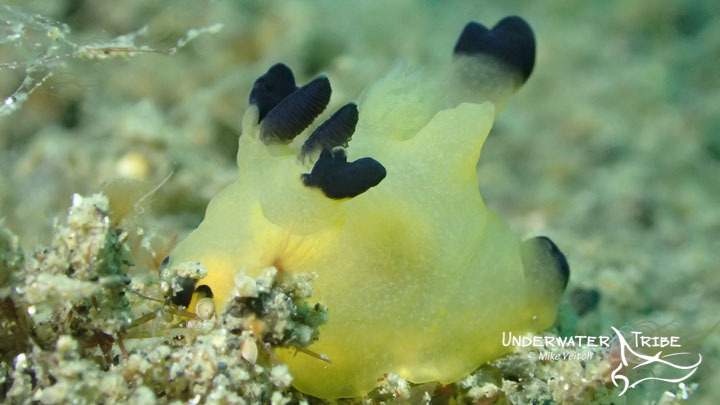 Sometimes the best subjects in Lembeh are ones that we often just swim right on past. 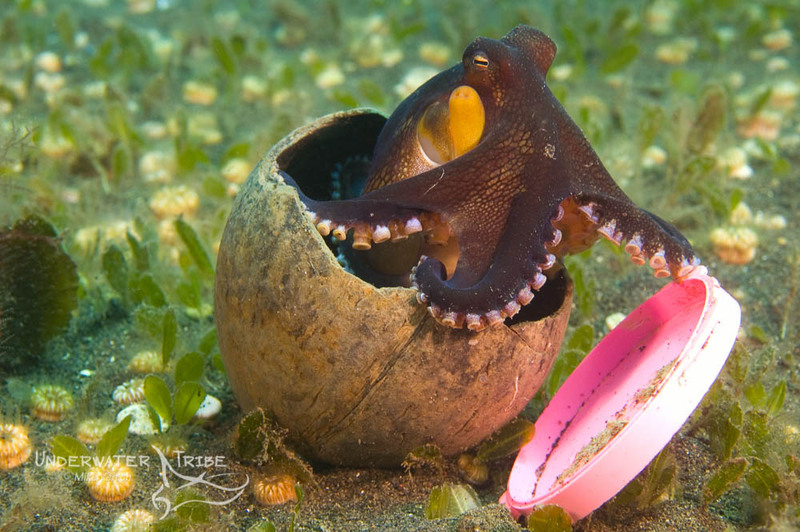 When people come to Lembeh they are usually in search of some of the more hard to find critters on the reef: exotic species such as hairy frogfish, flambouyant cuttlefish, and blue ring octopus are typically the critters that everyone wants to find. 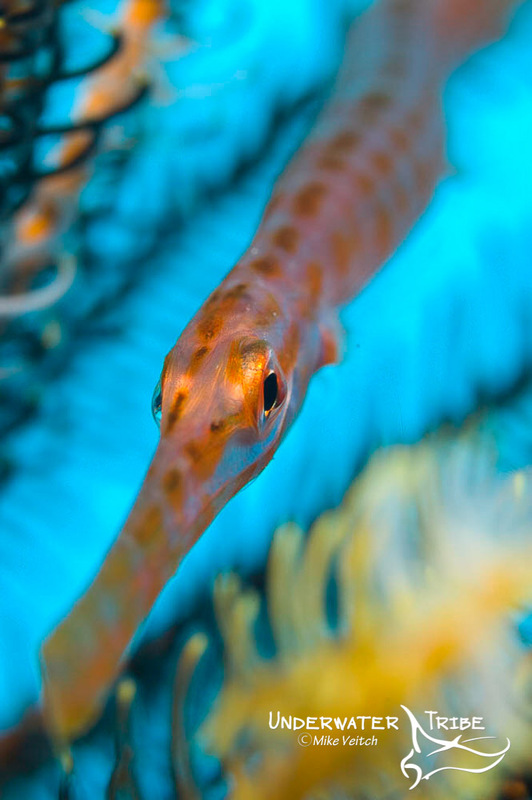 More common subjects such as lionfish and the blue ribbon eel, are often “poo-pooed” by those in the know and many photographers will often swim past them. However, it’s sometimes these subjects can make photographers work a little harder and experiment more than usual in order to take a photo that is slightly different from the norm. In this photo, I have shot the blue ribbon eel with a wide open f-stop in order to give it a limited depth of field and therefore stand out from the blurred out background as opposed to shooting it with the black background that is so popular with macro photos. 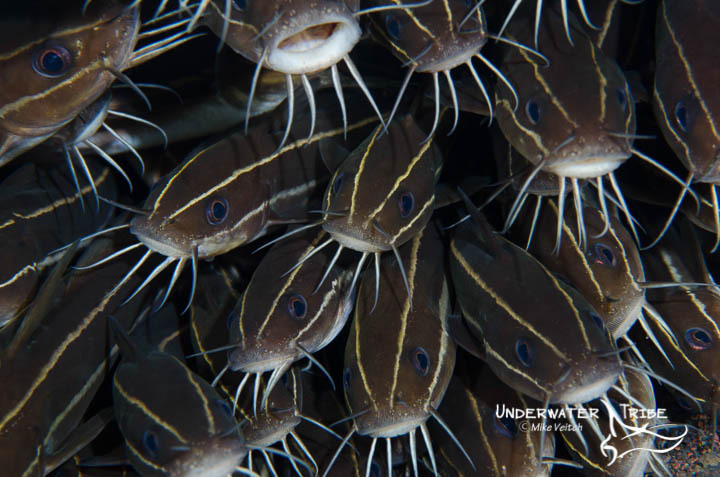 Next time you are out on a dive, don’t just swim past the subjects you see all the time, stop and open yourself up to some new ideas and try something different, you may just be glad you did! 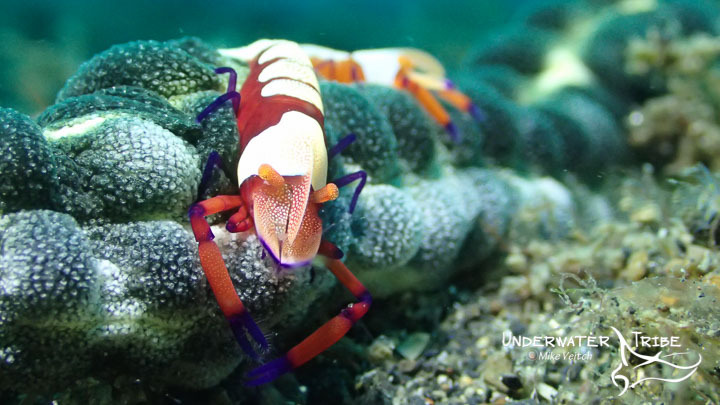 One of the more interesting behaviours that divers can encounter underwater is the always entertaining relationship between a cleaner shrimp and the creature that is being cleaned. 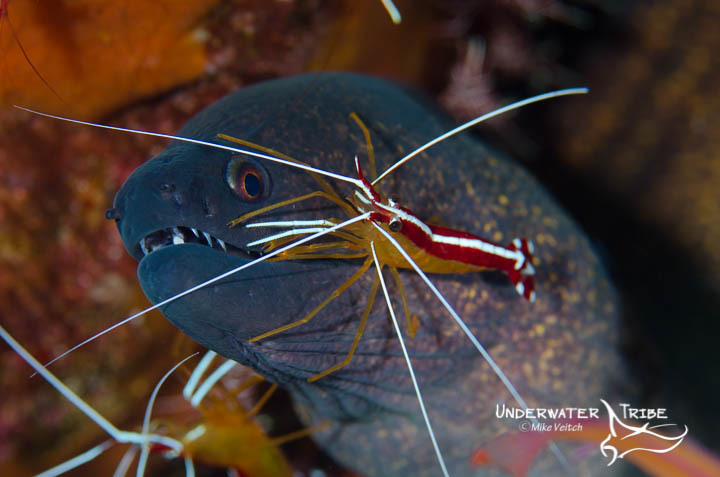 It might look like the shrimp is an easy meal for a moray eel as it prances along the morays head but in fact the moray more than tolerates the shrimps presence as it picks parasites from its skin and gums. 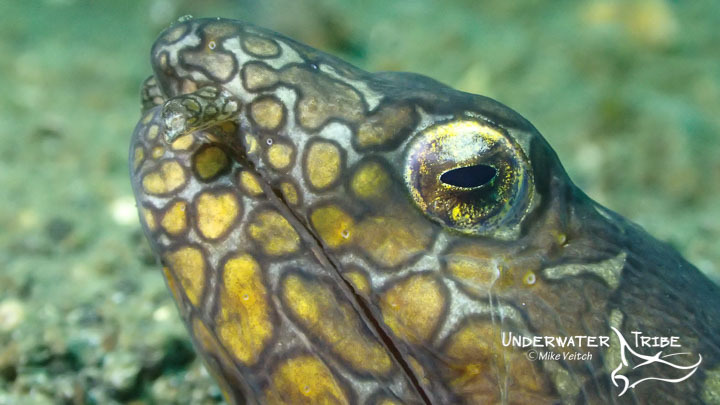 I always enjoy watching the “fearsome” moray flinch when the shrimp grabs a particularly sensitive piece of skin from the eel. 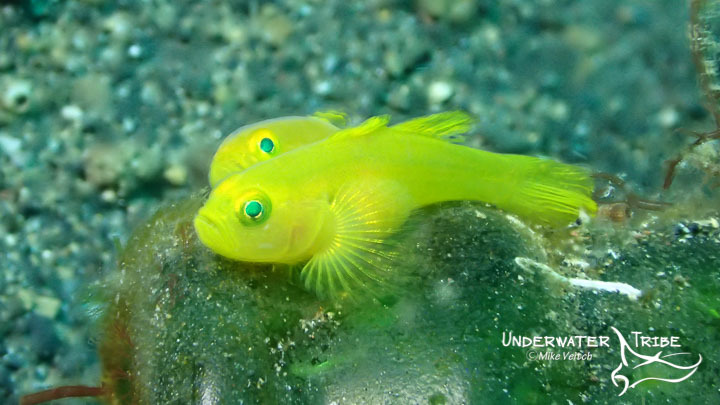 The observant diver can witness all kinds of cleaning behaviour on the reef at all times of day. 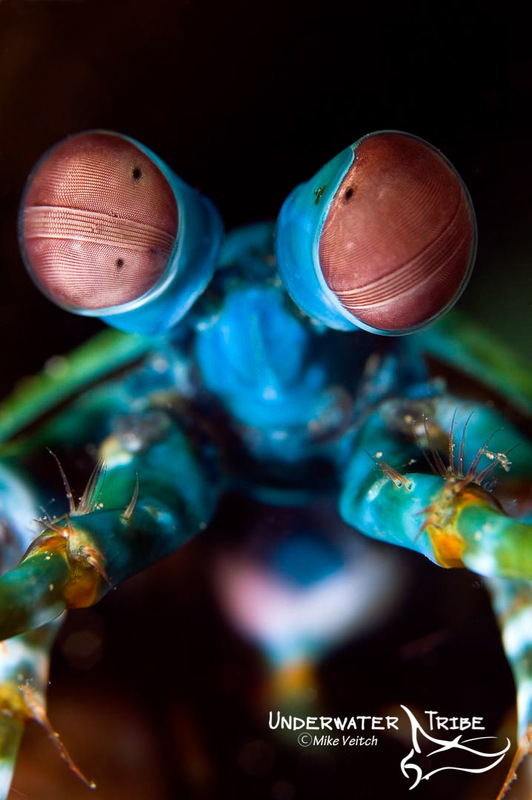 Shrimp are one of the more active cleaners but many species of small fish such as wrasse and butterfly fish are also commonly found cleaning other denizens of the reef. Although it is common to see most fish visit a cleaning station from time to time, perhaps the most common visitors to these “clinics” seem to be moray eels. 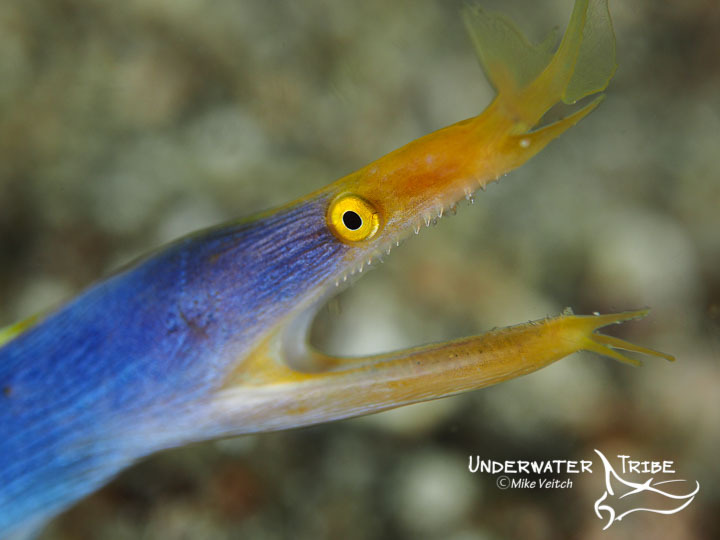 In this photo, a yellow margined moray eel is being cleaned by a scarlet lady cleaner shrimp beneath a small coral head at the Seraya Secrets dive site in NE Bali, Indonesia. Interested in seeing more of this activity? 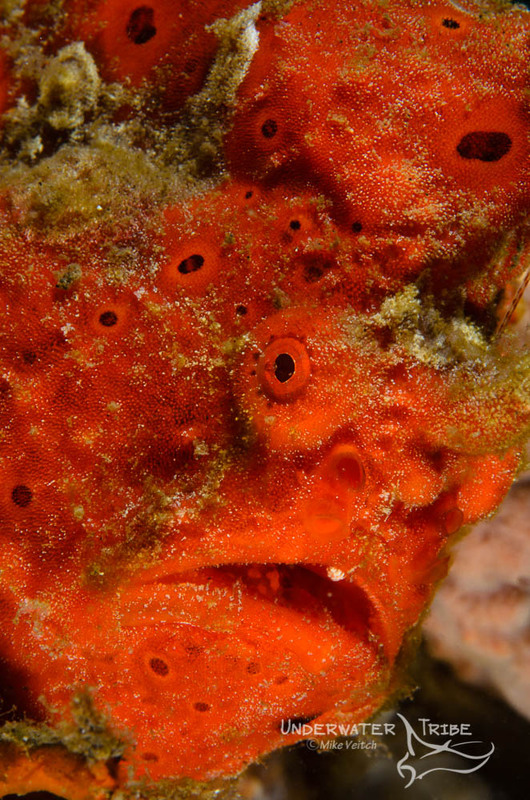 We frequently run trips to NE Bali where the diving and photography are easy and very rewarding! Have a look at our Bali Safari page for more details. One of the more unique looking photos you can take are of fairly common subjects but shot in an abstract way. A simple way to do this is with a macro lens and using your “artsy” eye to see outside of the box. In this photo of a wrasse in Bali I go right up close and personal and only focused on its pectoral fin rather than shooting the entire fish. This style of photograph works extremely well with varied colored tropical fish which have interesting and unique designs. Try out shooting abstract photos the next time you are shooting macro. This photo is a from a great site that I haven’t visited for a while, Secret Bay in the far north west of Bali in the town of Gilimanuk. 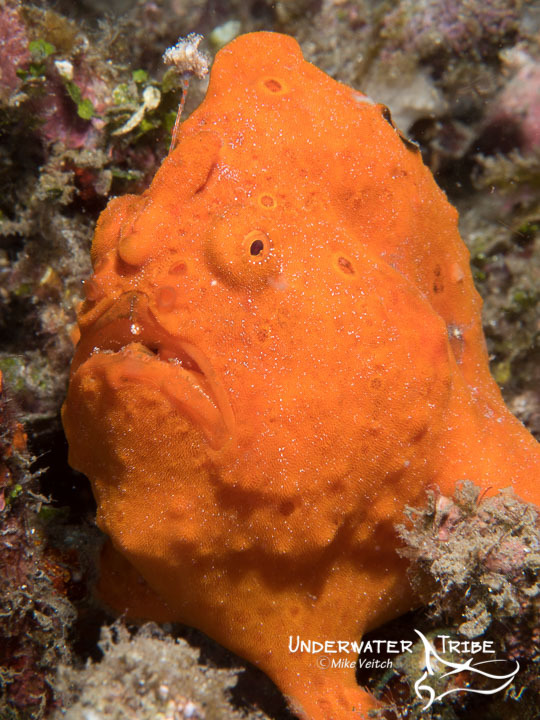 Secret Bay is a great muck diving location with lots of critter action including many resident frogfish such as this bright orange clown frogfish, Antennarius pictus, which was sitting perfectly in a sponge. 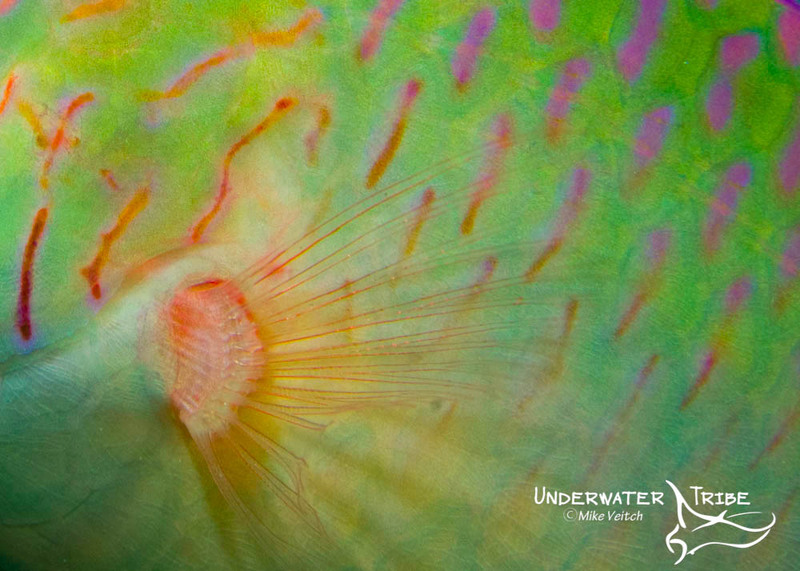 Photo taken with a Nikon D7000 in an Aquatica Housing with Sea and Sea strobes, f36, 1/250 and 60mm lens.